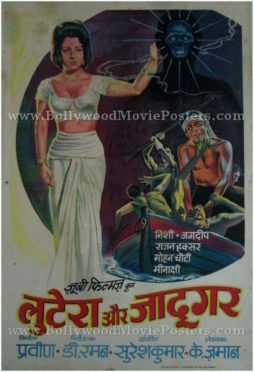 Vintage Indian poster for sale of the old Hindi film Yuvraaj (1979). 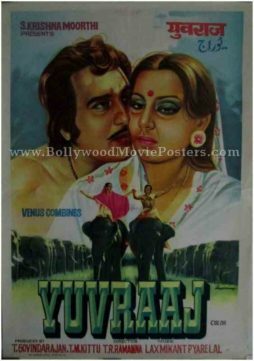 This is an actual surviving old Indian movie poster for sale of the 1979 action drama that starred Vinod Khanna and Neetu Singh in lead roles. Printed and circulated during the original first release of the film (somewhere in the late 1970s), this vintage Indian poster was printed for publicity of the film but never ended up being used. This old Indian movie poster for sale was originally designed in oil on canvas format by a leading art studio. This stunning lithographic print captures the beautiful brush strokes with which lead actors Vinod Khanna and Neetu Singh have been painted. The title of the film appears in fascinating typography at the bottom. Old school Bollywood poster for sale of the Hindi film, Parde Ke Peechey (1971). This is an actual surviving vintage Bollywood poster for sale of the 1971 Hindi film that starred Yogeeta Bali, Bindu, Jagdeep, Vinod Mehra and Pran in prominent roles. 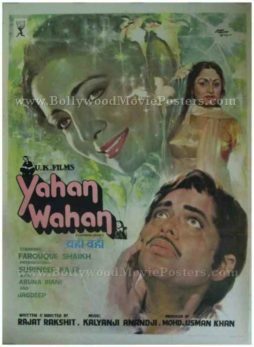 This vintage Bollywood poster was designed and printed for publicity of the film a few years after its original first release (somewhere in the late 1970s). This old school Bollywood poster for sale was designed by a poster art studio in Delhi called Gulati Arts. Originally designed in hand painted oil on canvas format by Delhi poster artist B.R. Gulati, this vintage Bollywood poster captures actress Yogeeta Bali and Pran in quirky hand painted portraits. 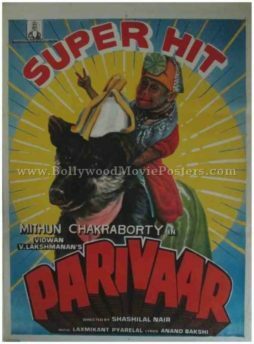 Old Bollywood movie poster for sale of the classic Hindi film Parivaar 1987. This is an actual surviving old Bollywood poster for sale of the 1987 Hindi film that starred Mithun Chakraborty and Meenakshi Sheshadri in lead roles. The film also featured two animal stars, wonder dog Jaani and monkey Savithri! Printed and circulated during the initial release run of the film (somewhere in the late 1980s), this Mithun Chakraborty movie poster was designed for publicity of the film but never ended up being used. This Mithun movie poster was originally hand painted on canvas by a leading poster design studio in Bombay. Interestingly, instead of using portraits of the stars, the Bollywood poster artist has chosen to highlight the two animal actors from the film. Monkey Savithri who plays the role of Bajrangi in the film is seen riding on top of wonder dog Jaani who played the role of Bahadur. The monkey is seen flashing a victory sign in this obscure Bollywood poster. This is an extremely rare instance in Indian cinematic history where two animal actors have been chosen as the stars of the Bollywood poster, making this obscure Bollywood poster highly collectible! The hero of the film, Mithun Chakraborty finds mention in this old Bollywood poster only in text at the bottom. The title of the film is seen in stunning 3D typography, with an announcement on the top that declares the film as Super Hit. 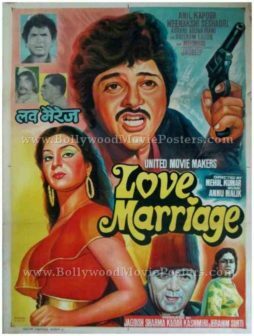 Old Bollywood poster for sale of the Hindi film Love Marriage (1984). This is an actual surviving vintage Bollywood poster for sale of the 1984 Hindi film that starred Anil Kapoor (of Slumdog Millionaire fame) and Meenakshi Sheshadri in lead roles. Printed and circulated during the original first release of the film (somewhere in the early 1980s), this old Bollywood poster was designed for publicity of the film but never ended up being used. This vintage Indian film poster was originally hand painted on canvas by leading Bollywood poster artist Manohar Suresh. A fabulous hand painted rendition of Anil Kapoor holding a gun is seen prominently in the poster. A quirky hand painted portrait of Meenakshi Sheshadri appears alongside. 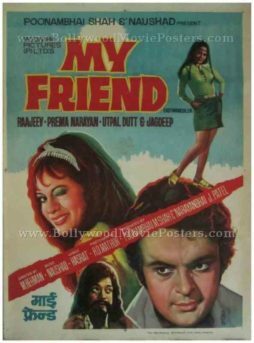 Smaller portraits of Mehmood and Aruna Irani are seen at the bottom of this old Bollywood poster. This old Indian poster uses a unique combination of both hand painted artwork as well as still photography in its design. Small sized black and white still photos of actors Shreeram Lagoo, Asrani and Jagdeep are seen on the top left of this old Bollywood poster for sale. The typography adds a unique twist to this vintage Bollywood poster by shaping the letter “O” into a heart. Very rare original old Bollywood poster of the hit Guru Dutt film, Aar Paar (1954) for sale. This is an actual surviving vintage Bollywood poster of the 1954 hit Hindi film that was produced and directed by one of the most influential filmmakers in Indian cinema, Guru Dutt. Aar Paar featured Guru Dutt in the lead role along with Shyama. This artistic hand painted Bollywood poster features a stunning portrait of Guru Dutt wearing the uniform of a cab driver at the bottom. A close up of actress Shyama is seen on the top. 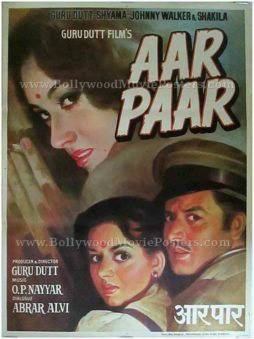 Aar Paar is a 1954 Bollywood movie directed by and starring Guru Dutt. The film also featured Johnny Walker, Shyama, Shakila and Jagdeep. Aar Paar is remembered till today for its super hit music. Songs like “Ja Ja Ja Ja Bewafa,” “Babuji Dheere Chalna” & “Kabhi Aar Kabhi Paar” have earned an unforgettable status thanks to the film’s music composed by O.P. Nayyar. 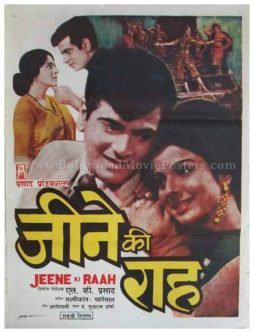 Old Bollywood movie poster of the Hindi film Jeene Ki Raah (1969) for sale. 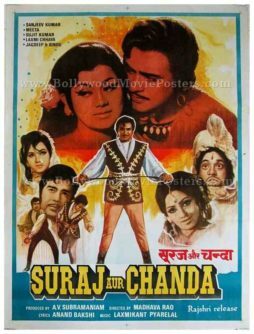 This is an actual surviving publicity poster of the 1969 romantic film that featured Jeetendra and Tanuja in lead roles. Printed and circulated a several years after the first release of the film (somewhere in the early 1980s), this vintage movie poster was printed for publicity of the film but never ended up being used. Jeene Ki Raah is a 1969 romantic Hindi film starring Jeetendra, Tanuja, Jagdeep and Sanjeev Kumar. Songs from the film sung by Mohammed Rafi and composed by Laxmikant Pyarelal with lyrics by Anand Bakshi became very popular at the time of its release.